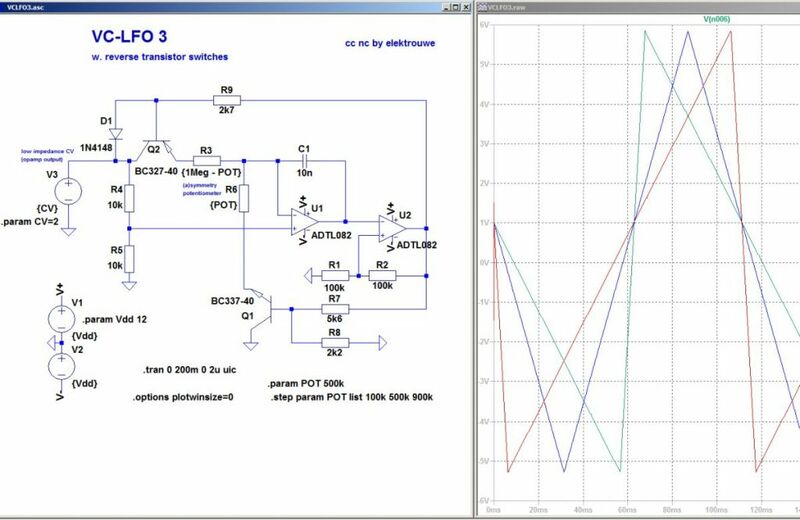 I have been playing around with a triangle core oscillator in a circuit simulator. I breadboarded it today and was a bit surprised to see that the pitch is rising when I move the symmetry/shape pot connected to the diodes toward either end of its range (pitch rises toward either extent). I tried changing resistor values around the pot and also tried buffering the output through another op-amp stage, but I was unable to remove this effect. I would like to understand what is causing this to happen, and how to mitigate it so I have a stable frequency across the range of the shape pot, if possible. where Va is the charging voltage (ending voltage minus starting voltage), and Vb is the voltage across the resistance. as you turn the pot, the resistance changes for charging and discharging, giving you variable slope. but, the total charge and discharge time must be kept constant to keep the frequency fixed. since the charge up voltage is the same as the discharge voltage, Va is constant, and C stays constant. R1 + R2 is almost constant, except for the variation in diode "resistance" as the current through them change as the pot is turned. it doesnt matter where the pot is set, the resistance through one side plus the resitance through the other side will always be constant. but, Vb1 and Vb2 might not be constant. if you arent using rail to rail opamps, the saturation voltage of the opamp will be different for positive and negative outputs. this is most likely the biggest culprit. 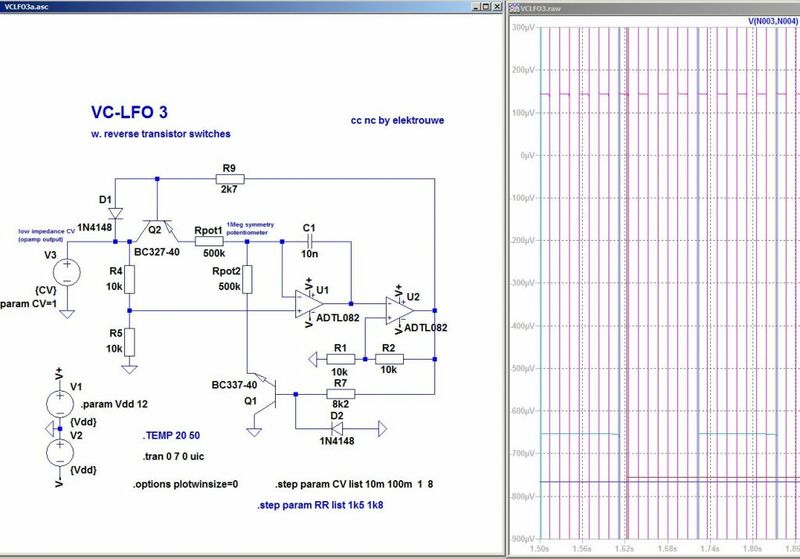 then, after that, it is probably the offset voltages of the opamps and the diodes. Is the topology inherently poor for this purpose, or can I potentially dial it into being pitch stable with better matching and some offset trimming or better opamp selection? you can get it pretty good with rail to rail opamps. there are a few other ways of getting a fixed voltage, such as using comparators, digital logic chips, zener diodes, or transistors (if you dont have rail to rail opamps handy). yes, the diodes are the problem: for the fast ramp up/down slope = potentiometer full left/right, currents are high which means low diode resistance. Potentiometer in middle position = medium currents = higher diode resistance. That's why frequency goes sharp at both pot. ends. Rail to rail opamps would improve symmetry adjustment but would not cure the diode problem. They need to be replaced by better switches e.g. CMOS switches (4066,4053...) or transistors. 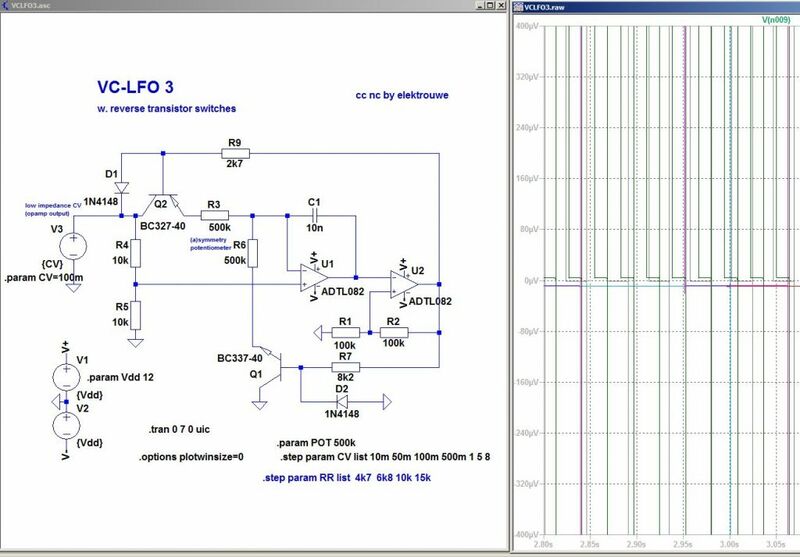 Here is a voltage controlled tricore LFO using reverse operated transistors. elektrouwe, thanks for posting the schematic. i have seen transistors used backwards from time to time, and am curious what are the advantages of doing this? also, why the diode protection on Q2, but not Q1? "... why the diode protection on Q2, but not Q1? good point, I was playing with both diodes and resistors. Best solution is to use diodes (keeps BE reverse voltage small thus maximizing CV range) and replace R8 with a diode and adjust R7 to 8k2. pictures show the "switch ON" voltages for Q1, Q2 from 10mV to 8V CV. Q1 shows a very small range (sub mV) because R7 can be optimized without beeing affected by CV. Q2 shows a larger variaten in ON voltage, because Ib depends on CV. But it is still <= 1mV. Here is my version of this circuit, using opamps to compensate the diode voltage drops. However pitch still varies somewhat with symmetry. 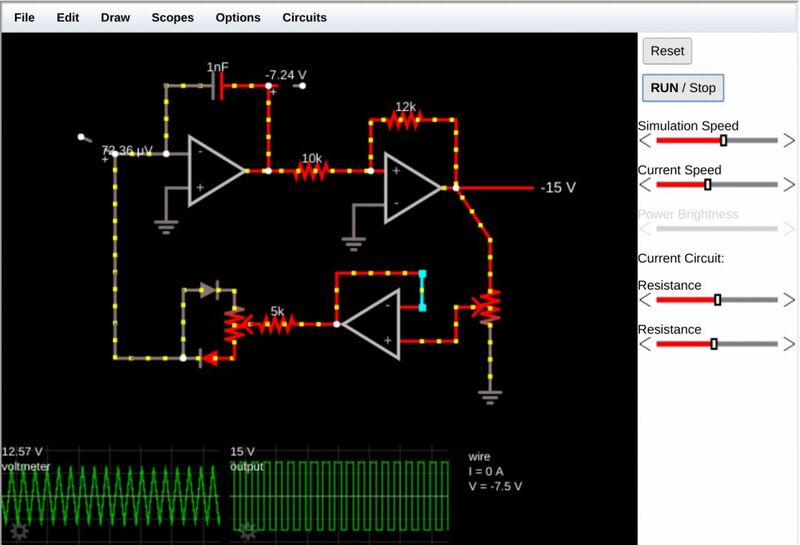 Perhaps R2R opamps will help, but it will still depend on the supply rails. Personally I dont mind the pitch variations so I never looked into it further. thanks for the explanation, i will keep this in mind for future designs. The math is inherently against you here. While R1+R2 is a constant, what you really need for constant frequency is 1/R1 + 1/R2 is constant. 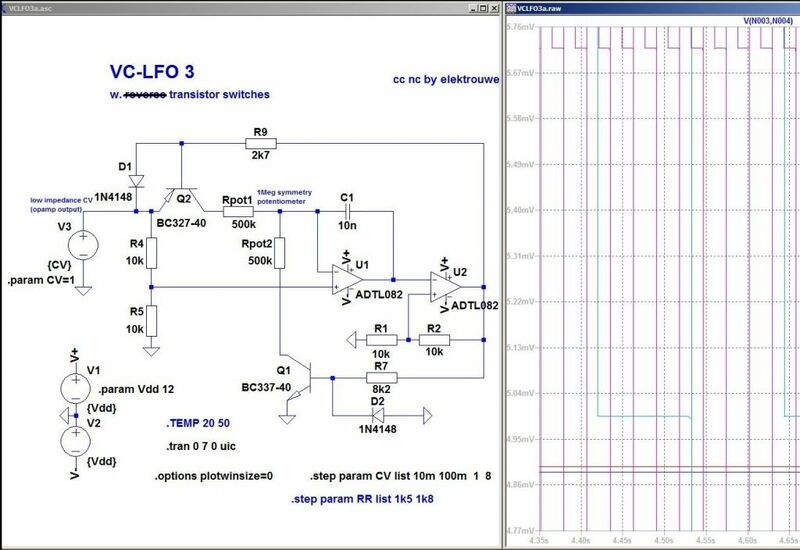 Better to start with a simple oscillator and then shape its output waveform, if you need pitch accuracy. the charge time is proportional to R1, and discharge propotional to R2, therefore the total period of oscillation is R1+R2 and the frequency is 1/(R1+R2), so as long as R1+R2 is constant, the frequency and period will be constant.